The ISGL Board of Directors request our community to become ISGL members or if they are already members, to renew their membership early. The special membership drive will be open from March 1 2018 to the end of Ramadan 2018. New membership or early renewal will be valid until Ramadan of 2019. Please support ISGL at this critical time and become new Member or renew your membership. It is important that If you attend ISGL then enroll in at least Associate level membership. 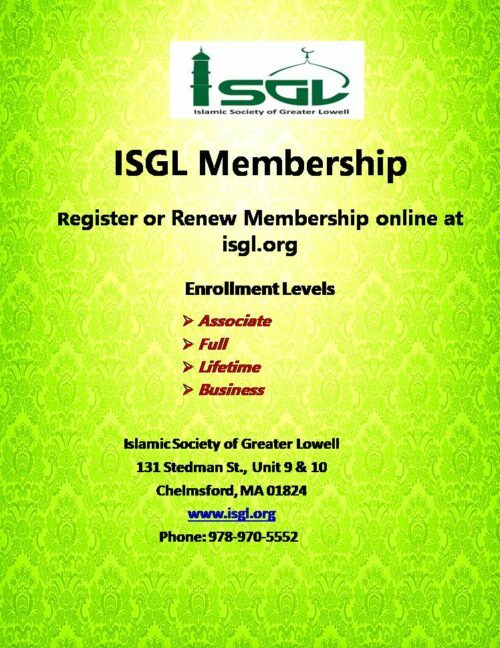 An increased number of enrolled members can enhance ISGL’s image as a pivotal Islamic Community Center in this region. Members will also have the privilege of using the new services offered at discounted fee in our new facility. Please join as a member to support ISGL. A new online membership form has been created with an integrated and secure membership fee payment process for your convenience.